Why Is Wyoming's Senate Agriculture Committee Voting on Anti-Abortion Bills? 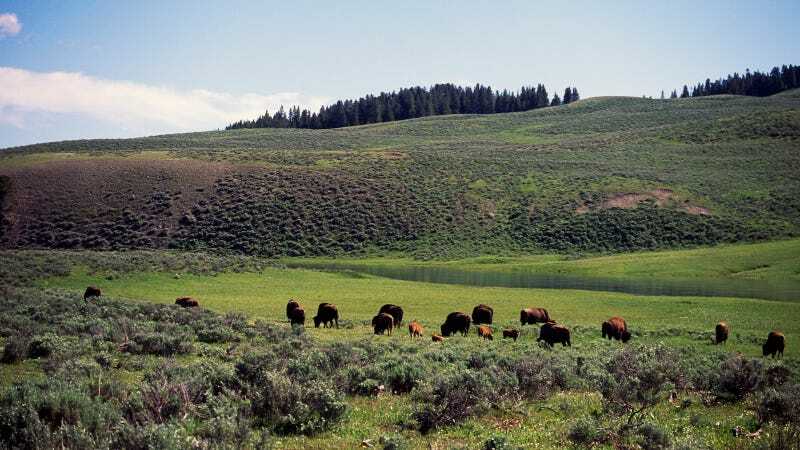 A herd of women grazing in Yellowstone National Park. Image via Getty. Did you know that in Wyoming, women are cattle? That’s the message Republican lawmakers are sending by passing two anti-abortion bills through the Senate Agriculture, State and Public Lands and Water Resources Committee. The committee, which is comprised of five Republican men, voted 4-1 in support of House Bill 116, which would make fetal tissue donation a felony, and House Bill 182, which would require doctors to offer women to hear the fetal heartbeat and undergo an ultrasound before receiving an abortion. The bills, which passed the House, now go to the Senate floor for a vote. The AP reported that the agriculture committee voted in support of the bill after hearing “from both sides of the abortion issue,” even though, again, the bill has nothing to do with farming or public land. A third anti-abortion bill, House Bill 250, did manage to land where it was supposed to—in the Labor, Health and Social Services committee. There’s also another way to interpret this, and it is no less bleak: Republicans don’t care about how women’s healthcare is packaged and processed because either way, women’s healthcare will wind up in the toilet.